Gipe has condensed more than two decades of working with and writing about wind energy into Wind Power: Renewable Energy for Home, Farm, and Business. 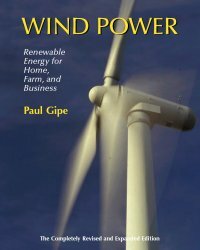 An extensive revision of his successful earlier book, Wind Power, Gipe has tapped his extensive experience with both small wind turbines and commercial wind power plants in North and South America, Europe, and the South Pacific for a one-of-a kind book on wind energy and how to use it. "There's more to wind energy," says Gipe, "than massive wind power plants." Wind turbines, large and small, can be used in applications distributed across the landscape, says Gipe in his new book. In Denmark, for example, three-fourths of the country's wind generation is produced by wind turbines owned and operated by individuals or small cooperatives who generate electricity for their own needs and sell the excess to the local utility. These wind turbines are the same as those used in California's wind plants, says Gipe, except that they are distributed across the countryside instead of concentrated in one location. Wind energy has proven so popular in Denmark that nearly five percent of the population owns a wind turbine, or part of one. Denmark generates nearly 20% of its electricity with wind. Germany, with the world's third largest industrial economy, now supplies 4% of its electricity from wind turbines. In the province of Ostfriesland, more than 50% of the electricity is produced by wind turbines, many built locally by one of the world's largest manufacturers. Small wind turbines play their part as well. On the French overseas territory of Île la Desirade, household-size wind turbines generate more electricity than can be consumed locally and the surplus is exported to the island of Guadaloupe. Similarly, an old French wind turbine provides essential electricity to a remote ranger station on Chile's wind-swept Patagonian steppes to protect the rare Magellanic penguins. Gipe's new book includes chapters on how to evaluate modern wind turbine technology, how to install wind turbines safely, how to design a stand-alone power system for living off-the-grid, and how to use electricity-producing wind turbines to pump water in rural areas. The extensive appendix includes easy to use tables for estimating the annual energy output of any wind turbine anywhere in the world, and lists manufacturers of wind turbines worldwide. While the book maintains its focus on small and household-size wind turbines, the new version broadens its scope to include medium-size and large wind turbines, as well as wind farms. Wind Power is profusely illustrated with more than 200 charts, line drawings, and photographs. Wind Power is the most comprehensive, non-academic book on the subject of wind energy in English. Written for the layman, Wind Power contains sufficient scientific and engineering detail for beginning professionals as well. Gipe, an American author, has made a special effort to provide content in both metric and English (U.S) units of measurements and frequently includes wind turbines from outside the United States. Wind Power contains photos of wind turbines operating in Canada, the United States, Chile, Argentina, Scotland, Denmark, the Netherlands, Germany, France, and Spain. Expanded section on wind resources, including more detail on how to account for changes in elevation and temperature. Expanded section on evaluating power curves, including actual measured performance from several micro and mini wind turbines. Expanded section on siting wind turbines, including actual measured noise emissions from micro wind turbines. Inclusion of more wind turbines from manufacturers outside the United States. More information on medium-size and large wind turbines. More examples and case studies of those successfully using wind energy. Expanded section on used wind turbines now includes used medium-size turbines such as those once used on wind farms. Expanded Appendix which includes more sources of information, a new glossary and multilingual lexicon, sources for used and reconditioned wind turbines, an expanded bibliography, and more conversion factors. Wind Power: Renewable Energy for Home, Farm, and Business, ISBN 1-931498-14-8 paper, 1-931498-60-1 cloth, Energy/Environment, 8 x 10 inches (20.5 x 25.5 cm), 512 pages, US$50 paper, US$75 cloth, 2004. Wind Power (2004) is available from the following suppliers. Chelsea Green Publishing Co.; P.O. Box 428; White River Junction, VT 05001; +1 802 295 6300; fax: +1 802 295 6444 or 800 639 4099. James & James / Earthscan. Codasat, Suite 1-4335 West 10th Avenue, Vancouver, BC V6R 2H6, Canada; +1 800 565 9523; +1 604 222 2955. Ceres Books, PO Box 11336, Ellerslie, Aukland, New Zealand; +64 09 574 3356. Banyan Tree Books, 13 College Road, Kent Town, South Australia 5067, Australia. The book is also available through Amazon.com, Barnes & Noble, Chapters/Indigo, and other internet booksellers worldwide.